2Independent-Travelers | Two people experiencing a new country and a new culture. 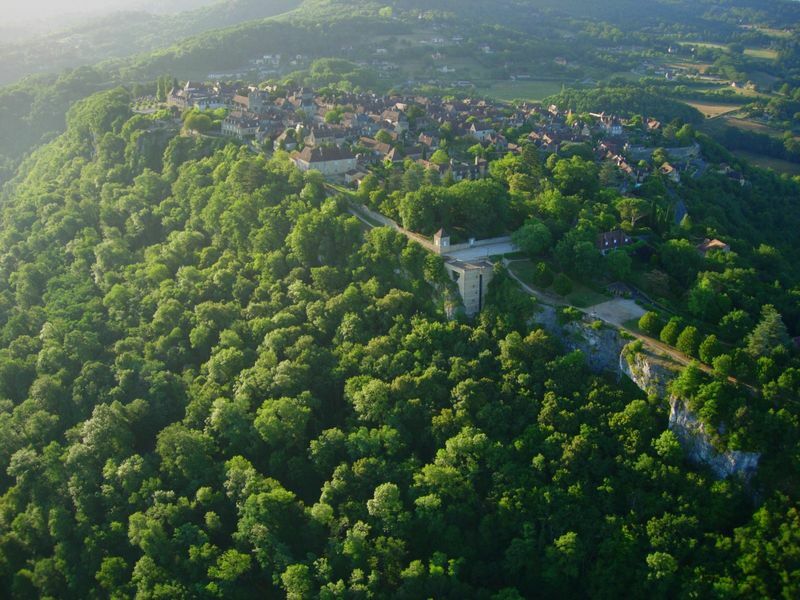 Domme is an almost perfect bastide: a walled village sitting on a hillside. 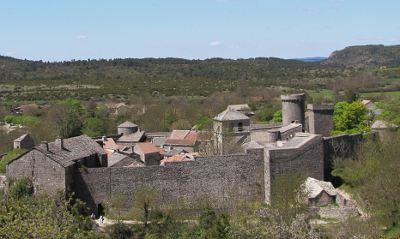 Between 1220 and 1372 about 700 bastides, also referred to as new towns, were built to colonize the wild and fertile lands of Southwest France. They grew as small, self-sufficient hamlets which eventually had to become fortified for protection. 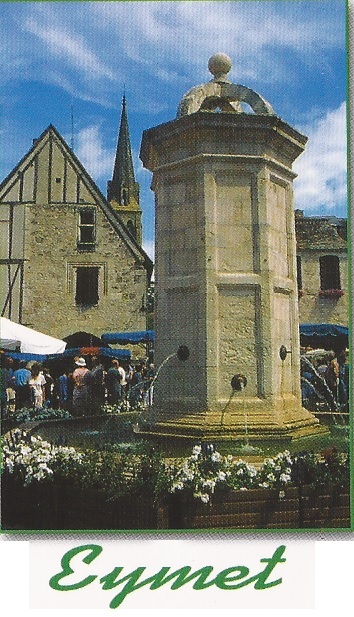 The following picture is the oldest and simplest that we saw: bastide Couvertoirade. 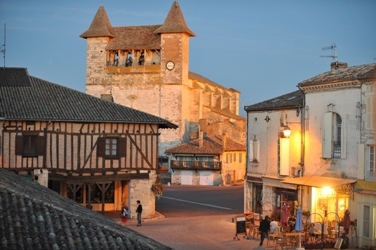 Compare that one to a more successful bastide of Eymet. These bastides enabled the rulers and those wealthy enough to own land to centrally locate their population, protect them, and to make money by raising taxes on their production. BUT, most importantly, it converted the serfs into freemen! Hence the birth of Democracy in France from the 13th century. 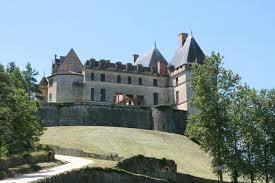 As the bastides grew in popularity and goods, they needed stronger walls and banding together inside them. Many were built on minimally established sites or on trading routes and were open to passersby and local farmers. They were planned to put some order into society….and did just that. 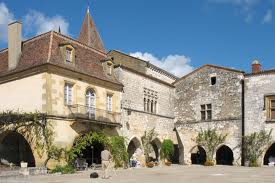 The bastides all had a central square lined with arcades that acted as a commercial hub and market. 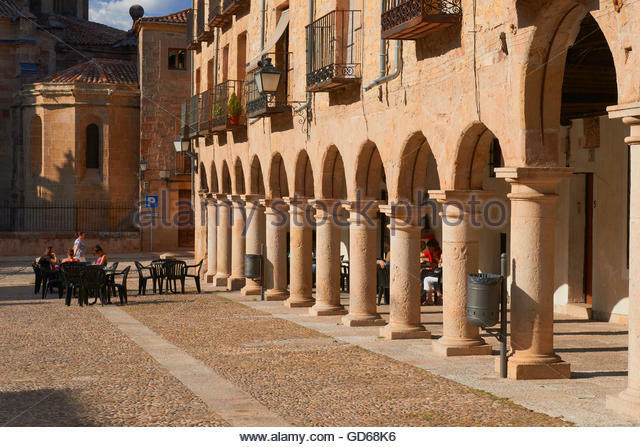 As you can see in the first picture, the arcades were rough hewn, but, for the 12th and 13th century, they were magnificent. The buildings themselves were 2 rooms deep: the first room the store, the second living quarters and the arcade for the display of wares. This is the square in Villereal. Since churches were not allowed on the square but were to be, in addition to the religious center, the Keep and fall-back in case of a serious attack. The façade is built as a fortress topped with large open areas where weapons and hot oil could be dispersed. Standing in front we could see the stanchion openings where the chains would either raise or lower the ramp to cover the moat….now filled with stones. 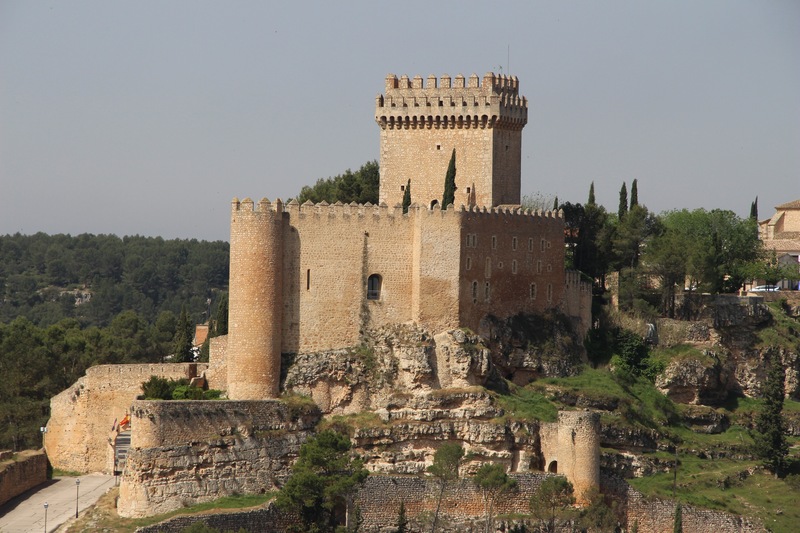 Although Villereal started in the 12th century, it must have done very well to support the family that built this castle in the 15th century. Although noting the solid wall around the castle, the marauding continued. 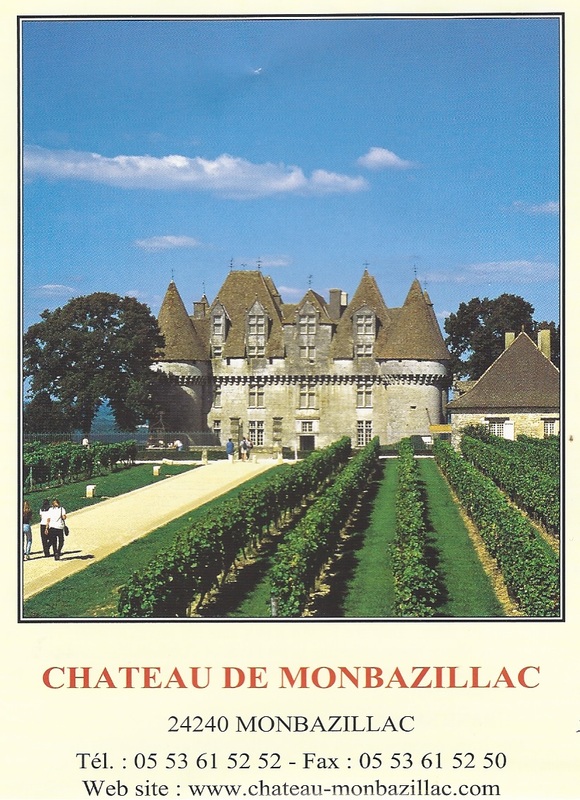 Before we began this journey, we decided to locate near Bergerac, both for the wineries and the bastides. 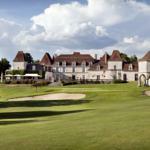 The beautiful Chateau Des Vigiers in Monestier, France was our residence for 5 days. 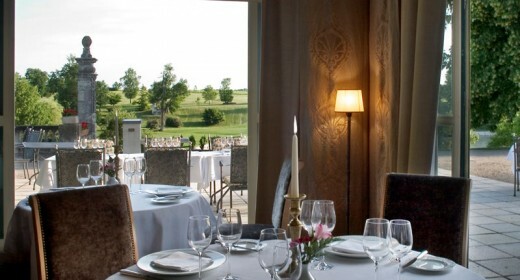 The ideal situation: the Chateau has 2 restaurants, 2 bars and is located on A hill-top with woods and a golf course. Busy days and lovely evenings. The next morning we drove to Montpazier. Notice how much bigger and more elaborate the following site is. Reason: in the 12th century the King of England married Eleanor of Aquitaine. 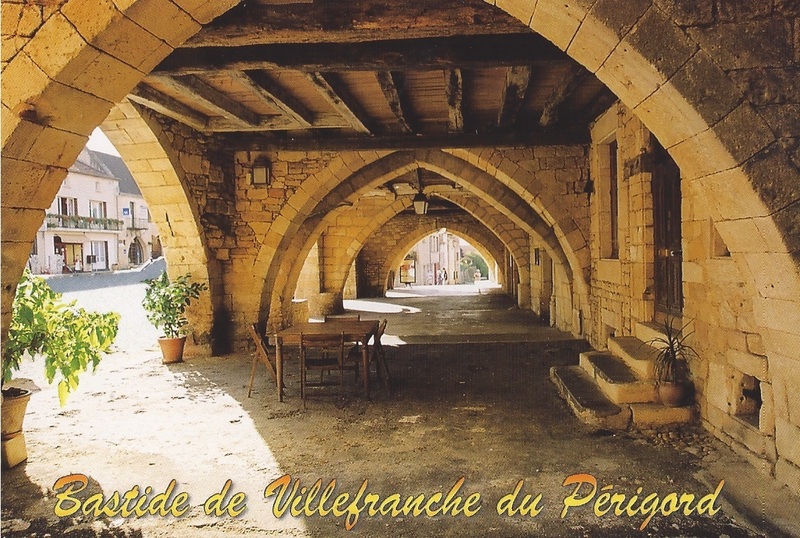 And they established this village….in spite of the problems between the French and English. This next picture shows more of the royal grandeur in the elegant town-houses. Notice some of the 2nd floor windows. We had lunch straight across the plaza under an umbrella and watched mini-vans plus horse drawn carts bring produce and wine. On our way back we stopped at this formal bastide, fully self-contained. 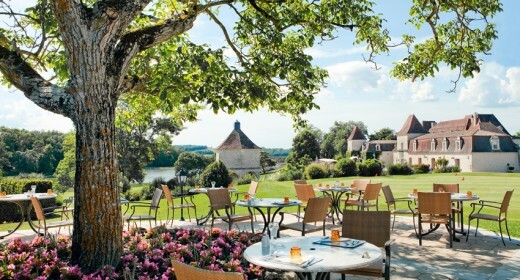 The Chateau was built in the 16th century and owned by the same family for over 600 years. The Chateau had a deep moat surrounding it. We also found a trap door for emergency escape in the basement….swimming out through the moat would be fine…except for the alligators. One look at those lush vineyards reveals the success of this estate. We made sure of it by sampling in the tasting room. 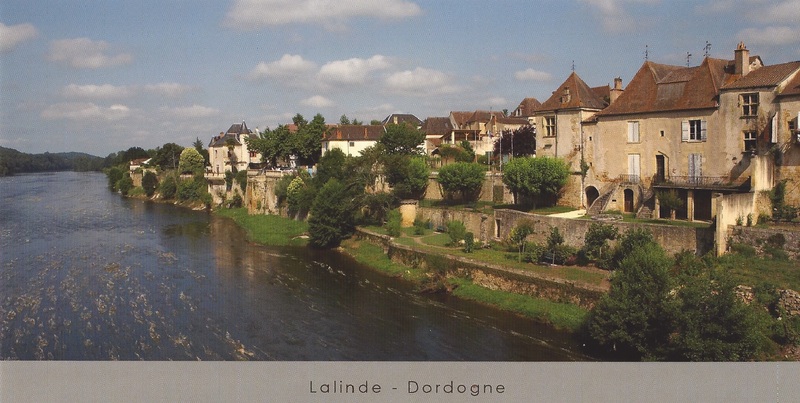 We stopped at the Lalinde bastide that was located right on the Dordogne River on our way to the hotel. It was well protected by the strong currents. The water levels could vary by as much as 50 feet and it was very swift at any level. We headed back to our Chateau to celebrate with a marvelous dinner and a clink of glasses for this wonderful discovery of the Bastides! The final chapter, number three. First I had to encourage Mike not to stop at every damn winery. (But later, more forcefully threatening death or dismemberment…) We stopped to see the Kolassi castle, the 14th century headquarters of Saint John and the Templars. Shortly after that the Templars were killed- but the why is the more important and lengthy than I can write about here. They city of Lemsos shows what the typical attraction for foreign visitors is- but we moved further up the coast where it was a bit quitter. This was the only picture that my dying camera could take. Our room on the 4th floor of the Capital Coast hotel had a wonderful view of the water. Even catching a very tiny, (if you have good eyes) boat in the distance. What I couldn’t catch was all three swimming pools in the picture. Two draw-backs: the air conditioner in the room didn’t work- but it did 10 minutes after the janitor showed up. We ask the front desk for bedside reading lights… We never got them… older people tend to read more often than watch TV when people pound on the door to turn down the sound. Dinner across the main street, was marvelous. The owner and Mike got into a wine discussion about the Cypriot wines we were drinking. Mutual interest often starts a friendship. These following paragraphs, written by husband, gives a bit more background to the country as a whole. There will be a taste of the wine further along- but no test. Cyprus is a small island–roughly 3500 sq. miles, making it larger than Delaware but smaller than Connecticut,–in the eastern Mediterranean Sea. It lies 60 miles west of the Syrian coast and miles south of Turkey’s southern shores. Athens is over 500 miles to the northwest. With its strategic position in the Mediterranean, the island has over the centuries seen many players and occupiers: the Phoenicians, the Hellenistic dynasty of Alexander the Great and the Romans. The Byzantines had their short stay in the 10th century. And, of course, there were the Crusaders (11th century). Richard the Lionheart captured the island then turned it over to the Knights Templar who in turn sold it to the French noble family of the Lusignans (a 300 year reign). Then came the Genovese and Venetians. The Ottomans had a 300 year hold before Britain took administrative rights to Cyprus in 1878. This hold lasted until 1960 when Cyprus established independence. However, animosity between the Greek Cypriots and the Turkish Cypriots soon surfaced and in 1974 the Turkish government sent troops to Cyprus to put down a coup d’état–a coup that was encouraged by Athens. Since that time the island has been partitioned into the ethnically Greek south Republic of Cyprus and the northern Turkish Republic of North Cyprus (recognized only by Turkey). A “Green Zone” buffer border separates the two–a 112 mile border with only 5 vehicular crossing points plus two more pedestrian crossings in the walled city of Nicosia, the capital of both “counties”. One island, two cultures, two languages, two currencies (Euros, south/ Turkish Lira, north). After over 40 years the island is still resolutely divided! Shortly thereafter we drove from Pafos and over the mountain to the North Coast of Cyprus. We stopped at an empty border patrol station, waited a bit- and then figured they had gone to lunch and then headed on. A few miles later a large motorcycle pulled alongside us. We stopped an explained our side of the story: there were no bars or people around to stop us at the checkpoint. He laughed and said they were eating lunch on the other side of the road. But you’ll have to pay a $25 dollars fine before flying home. “Not a problem” said Mike and thanked him. Our suite was on the fourth floor and not only overlooked the Mediterranean Sea, but had two balconies- an especially good feature when you are traveling and have laundry that needs to be washed and dried. Mike went off expecting and found the Kyrenia Castle, and loved it. Kyrenia is right on the sea and has existed since the 10th century BC. Excavations have revealed Greek traces that date back to the 7th century BC, but the site was developed into a city under Roman rule. 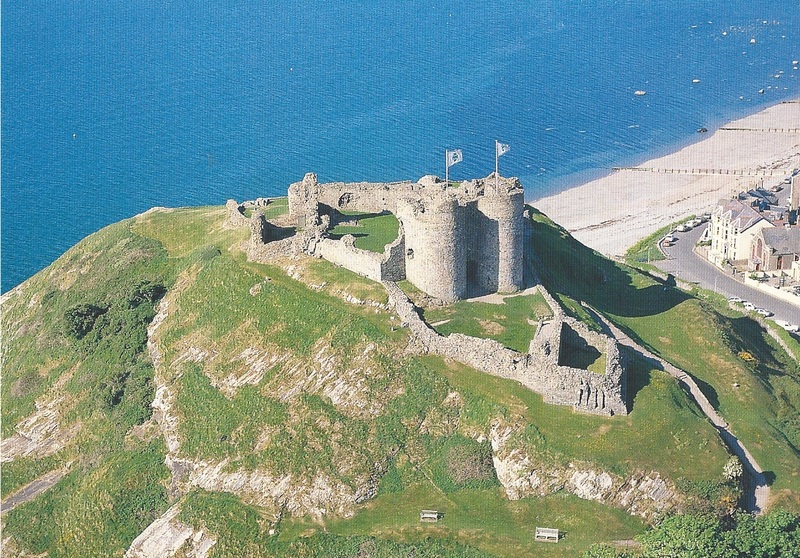 The castle endured several sieges but is still standing today. Mike toured the whole place in 100 degree weather- slightly cooler inside but not much! He returned enthusiastic from the sight and said, “That’s where we’re going to eat dinner tonight.” And I was delighted because the temperature was falling. We ate under the white awnings in the harbor above. Once seated on the portside there were four youths who sat at the table next to us. They were very friendly and had just taken the fairy over from Turkey. I said jokingly, “We only speak Californian English.” and we then enjoyed our dinner conversing with these young people. Mike left them with half a bottle of wine and they were delighted. The next day we decided to walk around the town where we were staying. Being in a hotel right on the Mediterranean Sea with an air-conditioned restaurant is dying and going to Heaven! Our next big ticket stop was the Hiliarion Castle on the mountain top of the ridge behind us. We parked in the lot below the Hiliarion Castle. I got out and had a drink while Mike hiked up to tour the castle. The heat and the steep- Mike went slogging up the mountain- temperature unknown but high. While I sat in an air-conditioned café below and had a glass of wine. Mike made a wonderful sketch of the Castle as a birthday present. We left a lot out, they’re still fighting but so are we! But we enjoyed this country enormously. Thanks Cyprus! Guess what this is. There will be a prize for the winner! 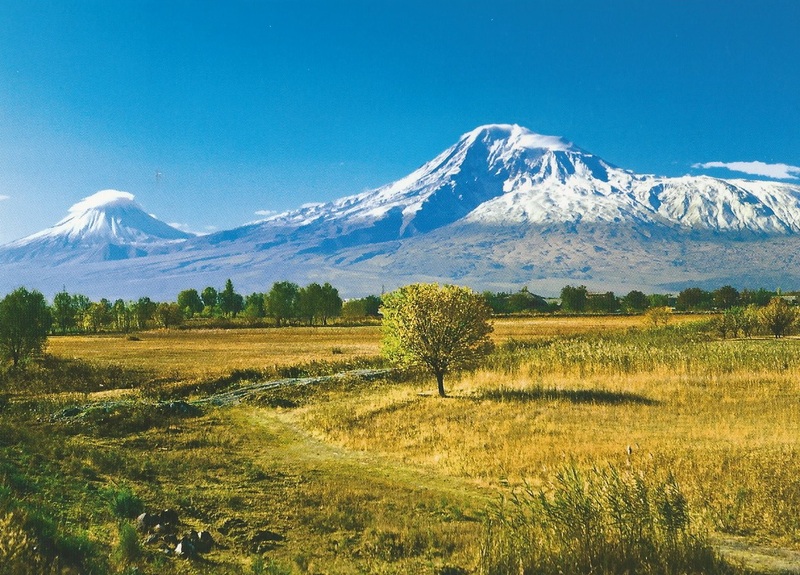 The history of both Armenia and Georgia begins with Noah’s Ark, pictured here, which to all accounts landed on Mount Ararat. Both countries metaphorically share this mountain and it can be said that their histories go back to the beginning of time. 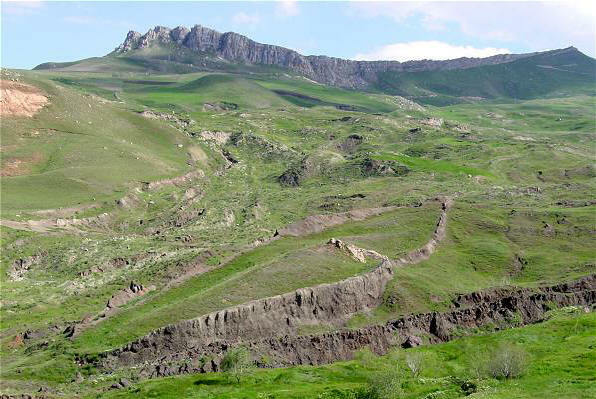 Georgians claim descent from “Kortholts” and Armenians claim their ancestry from his brother “Haik”, both great grandsons of Noah and his Ark. 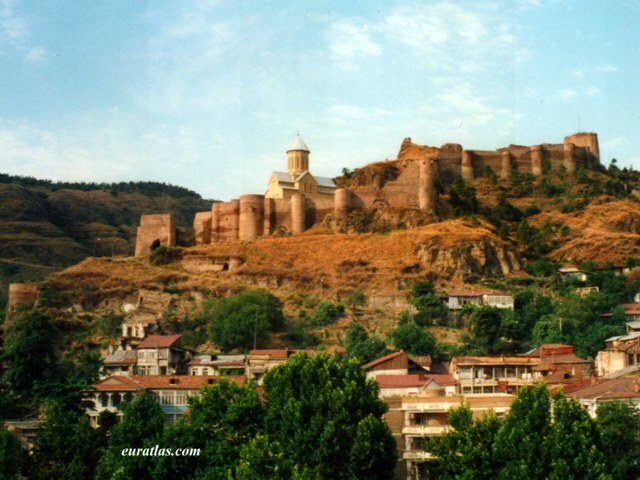 Georgia became the world’s 2nd Christian country preceded only by Armenia. After the dissolution of the Soviet Union, both countries were left with massive environmental problems …especially inheriting oil polluting from heavy metals, erosion from uncontrolled logging and over-grazing….among others. 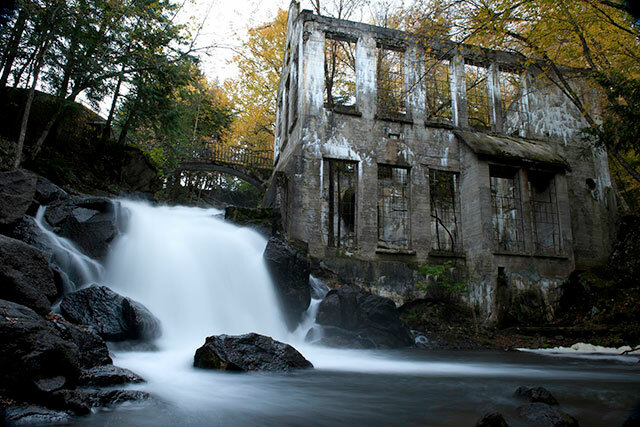 The following mill has disintegrated over about 20 years after their leaving Georgia. And this is a good example of all of their buildings. Driving into Tbilisi, Georgia, we quickly discovered one of their city’s idiosyncrasies: any alley is considered a 2-way street. The direction is determined wholly by who gets half way first. 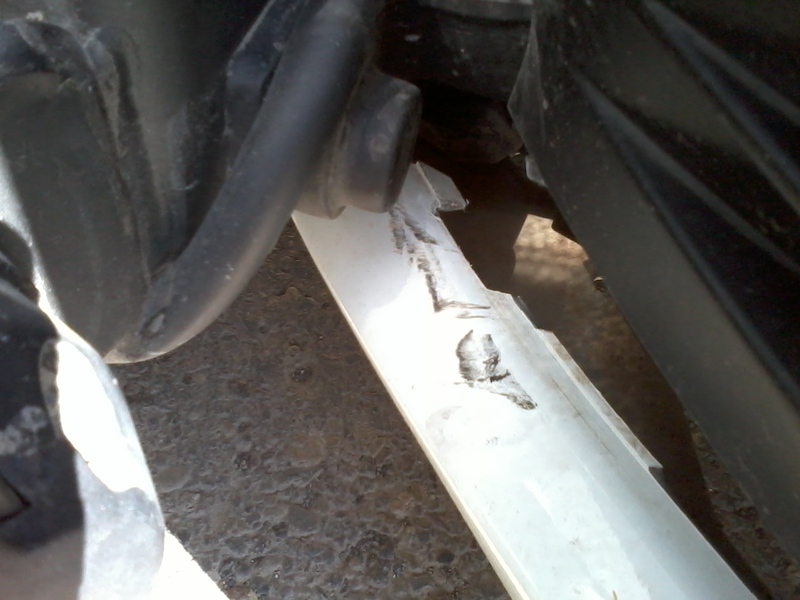 Since the front of our rental had been damaged coming cross-county. I do believe oncoming drivers felt we had nothing to lose….and that worked! 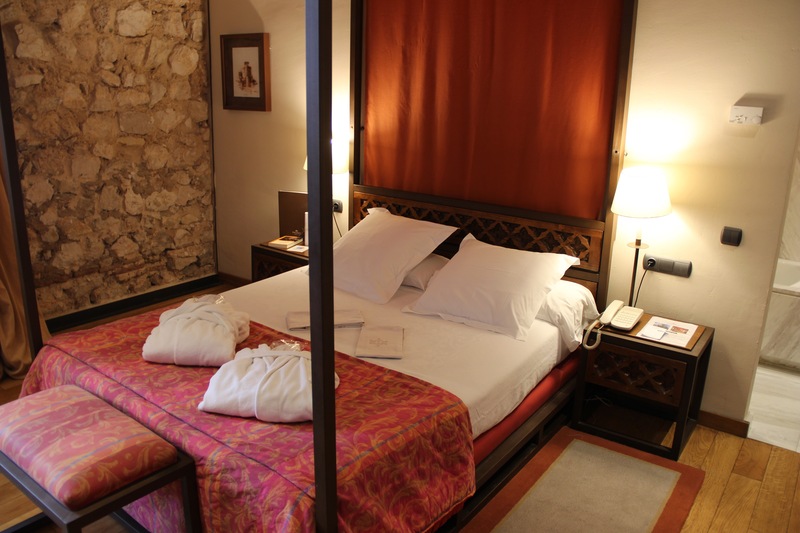 We found Hotel Kapola, an original converted mansion and checked into our Suite #12. They had overbooked. I had reserved a 4 day stay 3 months earlier, and since no-one wanted to pay the price of the suite….we got it by default! And it was magnificent. The large balcony overlooked the hillside, the river and the mountain. That night we ate at our roof top restaurant, overlooking the same view. Lovely music coming from a small band playing In the bar. The only problem was the waiter. Mike ordered a bottle of white wine, the waiter bought red….already uncorked and poured it without “presenting” it to Mike first. The situation was immediately solved by the manager. The waiter was a bit hostile to Mike afterward….but he had no idea how easily he got off! The next morning we met our local guide, Lila. For brevity’s sake I will reflect on a few sites, although all were marvelous. The most impressive was Saint Nicolas Church (4th century) surrounded by the remaining fortress walls sitting on the hill top. The city is growing up to the ancient Citadel and has just opened a tram running from down town up to it. Our energetic tour guide felt we would enjoy walking up the historic pathway to the Citadel…….but we compromised: took a cab up and walked down. 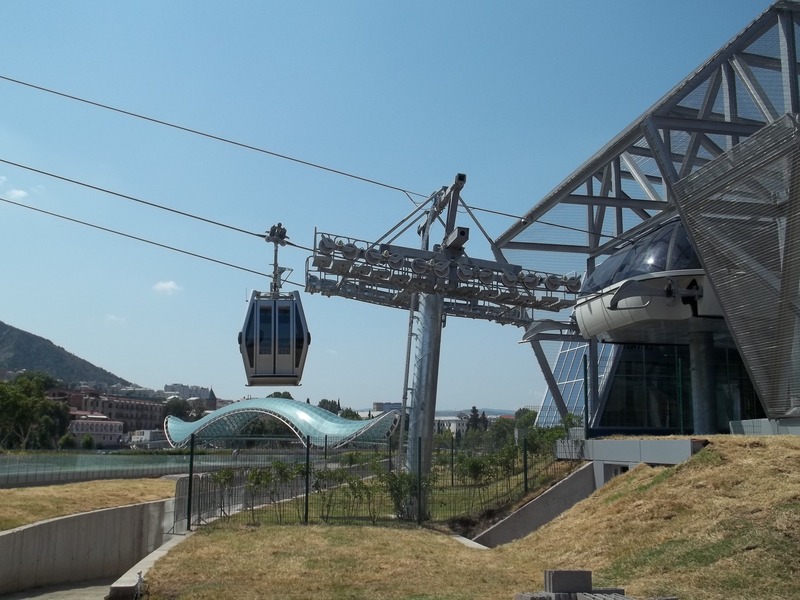 We saw the new tramway begin operations the day before we left Tbilisi. Afterward we walked through the Old Town Pedestrian restaurant street. While we ate, Lila, early 50’s, gave some insight on family life both before and after the Soviet Collapse. “First”, she said, “they got rid of all the intellectuals either by transferring them to ‘work farms’ or deporting them to Siberia. Then assigning jobs to all, regardless of experience, and paying minimum wage. Minimum housing….4 families to ONE flat. All worked until too old or too feeble, and then received bare subsistence pay. I had to move away to get an education and returned afterward as an educator at the University.” She said the older generation got used to this life, accepted it as normal and were lost, at first, when the Soviets left. This is what happened to her own family. View of the 6,000 year old monastery that will begin the sequel. The beginning of our drive to the Oslo Festival was not auspicious. The weather was drizzly and cold. 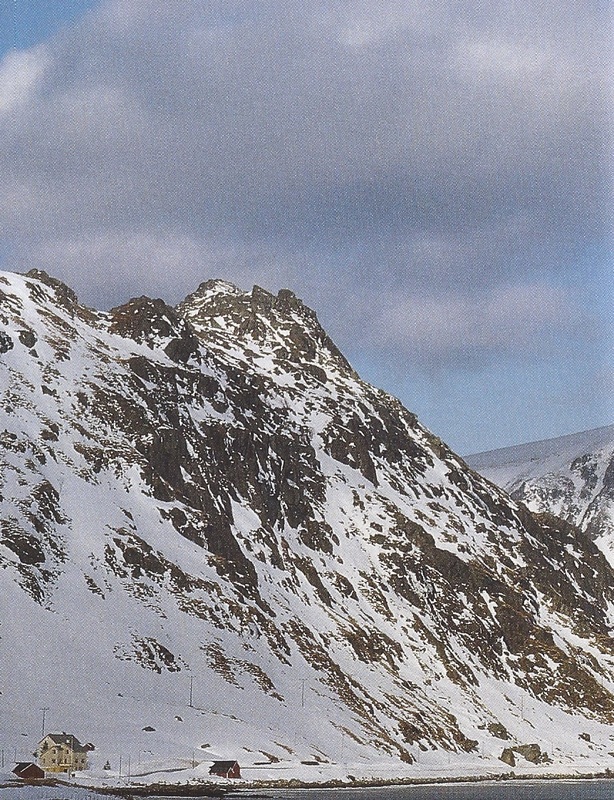 We needed to pass through 3 tunnels, catch a 20 minute ferry ride and drive up a snowy mountain. building IS the ferry station. Little did we know that the highway had been closed due to heavy snow. Even if there had been signs, we, couldn’t have read them anyway. After an hour of driving up through the snow, the sun came out and we realized that there was no one else on the road…The snowy berms reached 7 plus feet…..I know because I trailed my fingers through them. Lovely sunshine right down to Oslo. Our first stop was at the Viking Museum just outside the city. 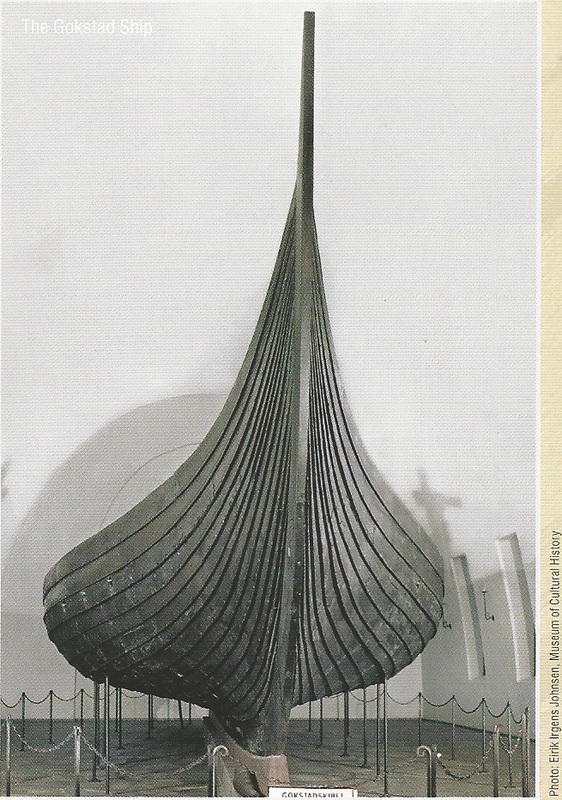 There were ancient ships from the 9th c. AD entirely excavated from burial sites. These were wealthy or powerful people wanting their ship and contents for the next world. One was so enormous that we had to climb to a balcony to see the inside. This spectacular craft was 90 feet long and 15 feet wide. Its burial chamber contained the body of a man in his 40’s. Besides the usual accouterments of guilded bronze, kitchen utensils, beds etc. it also had the bones of 12 horses, 6 dogs and a peacock. He was very special! On into the city busy with preparations for the combined celebration of Constitution Day and the revered 1800th century King Karl Johan Day. We drove to the town center Scandia Hotel but they were fully booked. 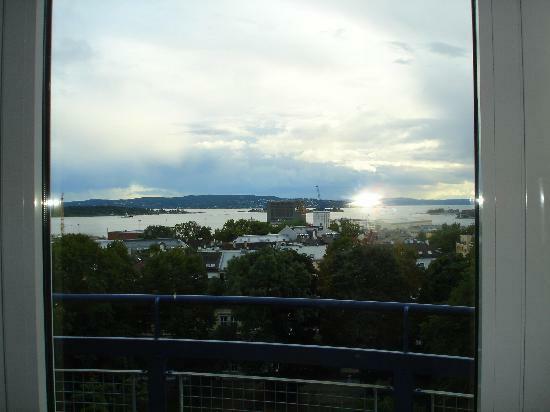 The gracious Concierge reserved us a room at the portside Scandia KNA Hotel having a lovely view of the Fjord from our balcony. The mountain beyond was lit up with fairy lights after dark. Mike had navigated our way through many dead-end streets and the holiday confusion down town with his uncanny sense of direction and 3 maps. 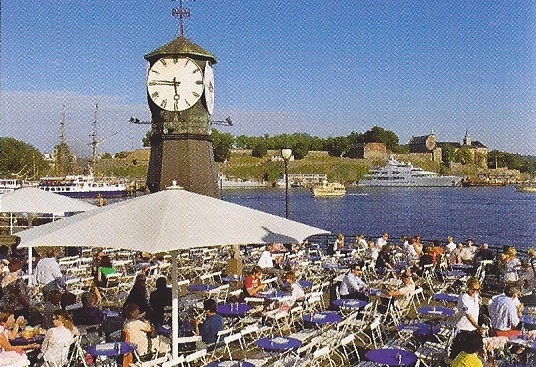 Our hotel was close to the portside and offered many restaurant choices. 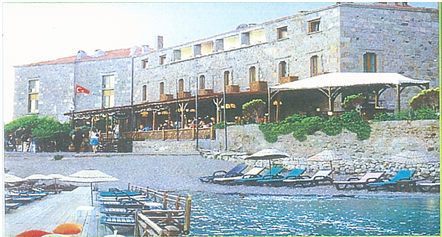 Some of the older buildings had been modernized with glass overviews taking full advantage of the bay. The area was very pedestrian friendly with cobbled-stone walkways and occasional fountain centered plazas. Music from the hotel and the surrounding area woke us. Oslo’s biggest holiday of the year was starting early and with great enthusiasm. After breakfast we walked to the park to observe the festivities. Individuals and entire families were wearing their regional costumes, some of which (we found out later) dated from the 1800’s and had not changed in color or style. 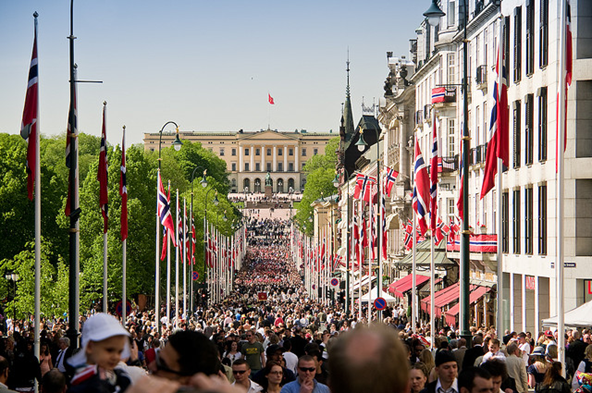 Families, youth groups and young adults marched from Johan’s Gate, the main street, passing the Palace with the King and Queen waving. They continued parading and singing through the park and down to the Port. There were many bands, school groups and military units; all singing and cheering with gusto. Many 3 generational families were dressed in regional costumes. The townspeople knew each other by their regional colors. Most women wore long dresses with fantastic embroidery at the waist and hem. Their families were also color-coordinated, including hats. It was a very social event. Around 5 o’clock we saw groups dispersing to the train station and others evacuating the car parks. The younger adults stayed on, having gotten into the beer early, and having a wonderful time. We were impressed to see the more sober ones assisting those who became inebriated. Around 7, looking for dinner, we walked toward Karl Johan’s Gate and found it a bit littered with celebratory trash and most of the restaurants had run out of food. We headed back to the wharf area and picked a restaurant over looking the bay. Many milling young people were having a jovial time, and, consequently, so were we. Oslo, and all of Norway, has much more to offer! 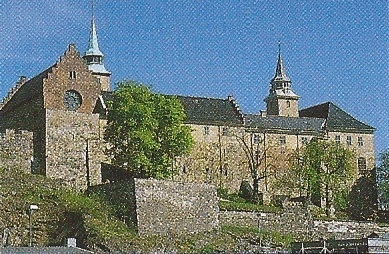 Akershus castle has defended Oslo since 13th century and will do so for a long time to come. 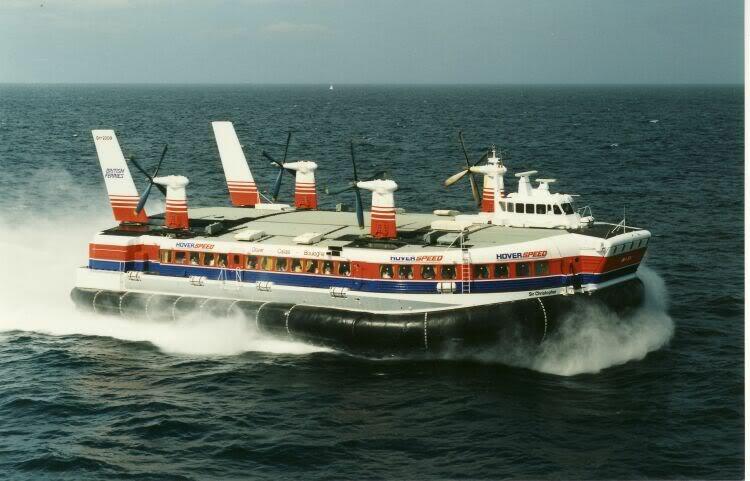 We took the Hovercraft from the Dublin ports to Wales. Boarding was crowded with noisy congeniality. “Learn as you go by observation” and we did. The people in the lead headed for the curved, split staircase, and ran up for the third deck. We were right behind them. The semi-circular tables over lookedthe center of the ship and down to the restaurant area. The booths were backed by broad windows with infinite views. 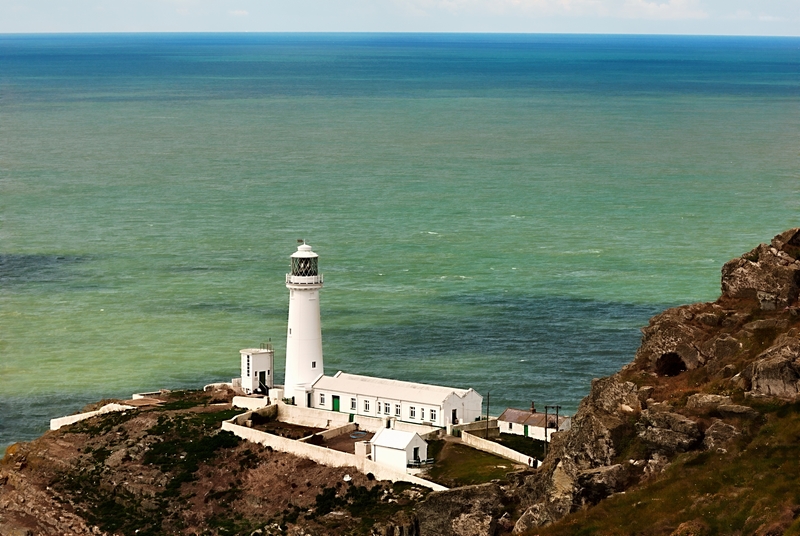 About two hours later we drove off, looking back at Holyhead Lighthouse. About an hour’s drive brought us to the extraordinary walled Conwy Castle. The huge 1243 structure overwhelmed both the city and us. 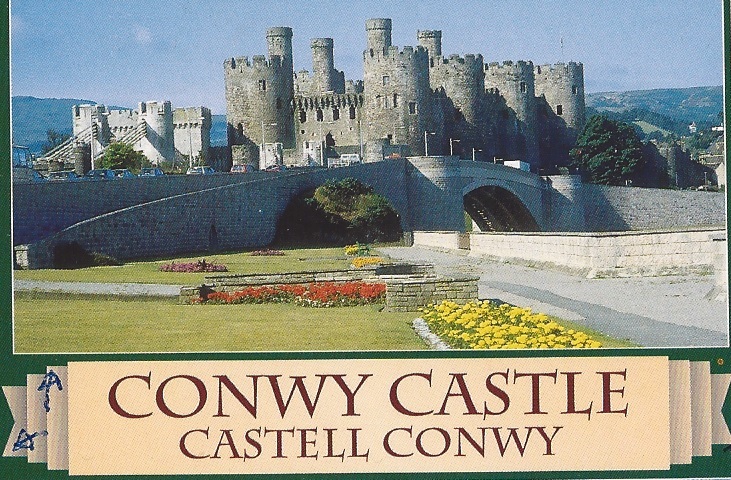 Checking in to a hotel, we hurried off to see this walled city and breath taking Castle Conwy. Even in the fading early September light, we were able to see that one of the abutments used to support the cast iron chains on this suspension bridge, attached to the castle. Extraordinary construction. The next morning we toured the old, but colorful village. 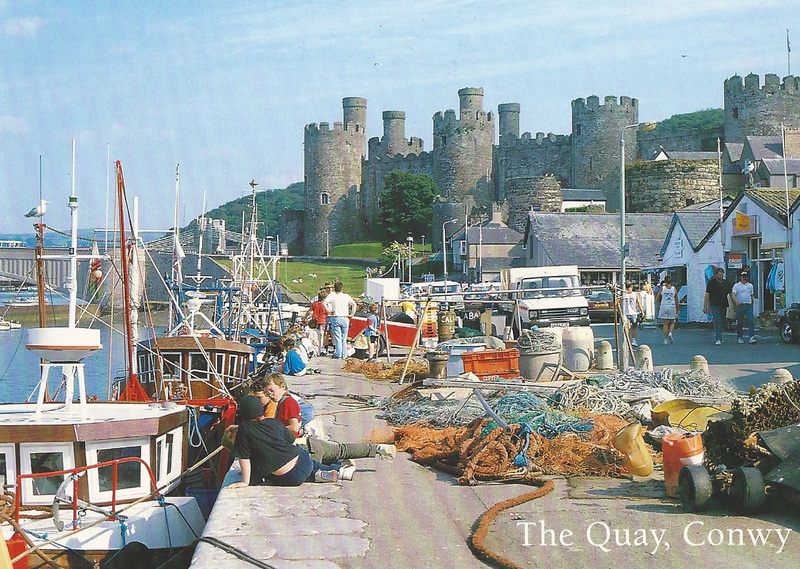 People were buying fruits and vegetables from the open fronted shops and fresh fish from the boats along the quay. Most of the crowd appeared to be local. That afternoon we drove to Langollen aqueduct and were amazed with what we saw . 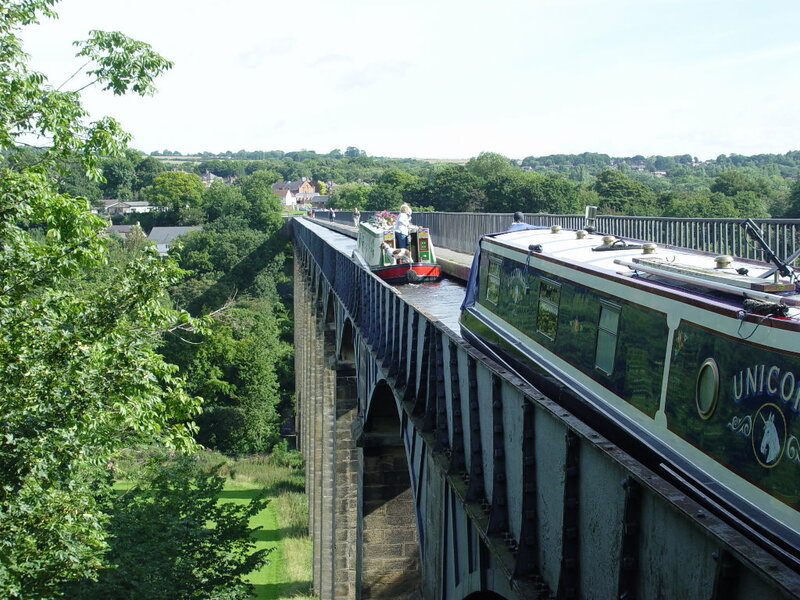 There was the aqueduct, 180 feet above the river! There were narrow boats and house barges winding along the surface. The depth of the passage was 5 feet and the width was 7 feet…all one way of course. 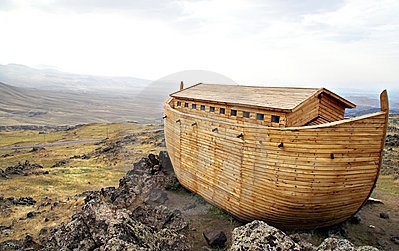 All of the water craft were built to these specifications. There were off-sets along the way where the barges could be parked. I wanted to climb on one. After seeing so many beautiful castles, we looked for a different structure with some obvious historical wear. Montgomery Castle, built circa 1071 by Roger de Montgomery, fit this requirement. During the Civil War it was demolished by order of the Parliament around 1650. We stayed in Montgomery village, and walked through misty rain to see the remaining structure on top of the hill…..marvelous view. Time was running out and we had to plot our return to Ireland so we headed to Castle Cricieth, not too far from Holyhead and our Hovercraft departure. 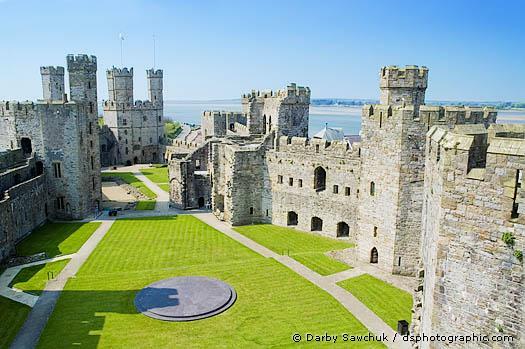 This structure was built 1272 by Edward 1st who set about consolidating English rule in Wales. Subsequent conflicts resulted in the castle being sacked. The town expanded in the 19th century with new transportation links. In 1868 It developed as a Victorian seaside resort which is the way we found it. Looking at the picture you can see several houses below on the right….we stayed at the second one….with both a view of the castle and the sea. The next morning, on our way to Holyhead, we had time to visit the last Castle of this trip and what a sight it was! 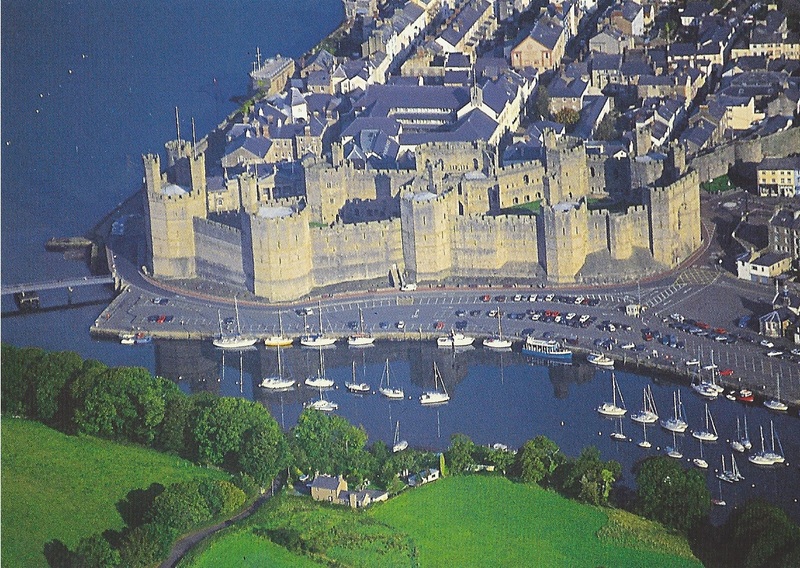 Castle Caernarfon was built in 1283 also by King Edward 1st. He wanted it to reflect Constantinople, Rome and the Welsh legend. And I think it does all of that. Because we would be on the ship shortly, and for several hours, we decided to walk through part of the Castle and did. Essentially wending our way back to Istanbul, we headed to Assos and the Caravansy Hotel by the sea. Our concierge graciously booked 2 days at this wonderful rustic resort that looked over the bay and up a hill to a castle. We had a good view of the acropolis in Pergamon as we passed, but we didn’t stop. The ride down the hills to Assos was long and hazardous but we made it and checked into our third floor room-with-balcony. 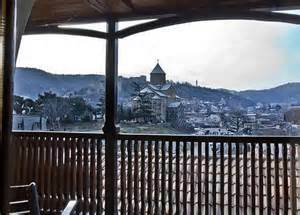 Only eight rooms had a view-with-balcony, which had a heavy overhang to keep out the weather and resembled a small watch-tower. Walking the waterfront and the tiny village only took 30 minutes. Off to the. Pool…freezing.. .ha! The 7:30 seating for dinner offered minimal choices: fish or chicken. The food was good and the service excellent. Then the rains came down and we got to watch passing ships from our watch-tower. Breakfast overlooking the bay, with some clouds and choppy waves. We tried walking up the hill to the village above but only got as far as the crumbling but majestic amphitheater when it started to drizzle. The rain actually enhanced the appearance of this ancient structure but not the quality of the dirt road returning to the hotel. We had to step off the road when cars passed. The second time this happened we heard some noise from a fruit orchard and there was a herd of goats, chewing quietly, staring at us. I whispered and they cocked their heads, moving closer, paralleling us along the fence fearlessly. Being unused to goats on the other side of a shabby fence, we walked quietly until the road shifted away. Then, bravely, we looked back and missed their curiosity. Watching them chew made me hungry. Nearing our hotel, we stopped at Gazleme, a small restaurant with grape vines covering the overhead lattice work that kept us dry. Lovely lamb stew. Our hotel was filled with Turks. The only English spoken was by one receptionist. Our Turkish was meager but people were very hospitable. Taking a ferry boat to “wine island” today. 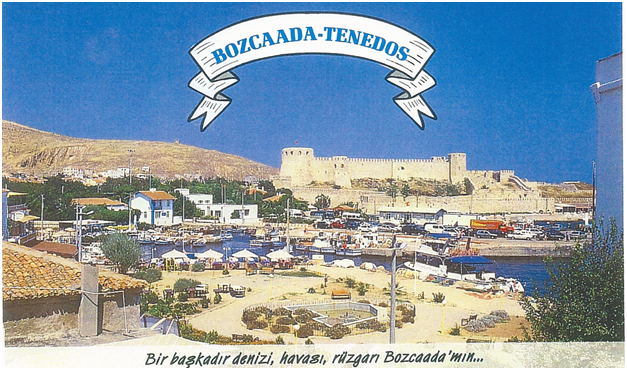 The approaching pier of this old fortress, “Bozcaada Castle” loomed over us. 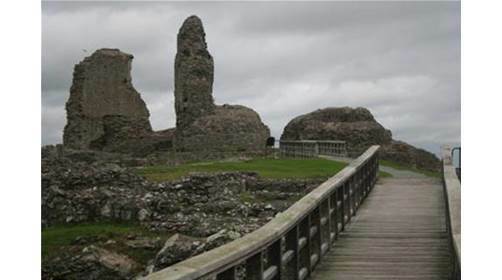 The castle was built originally in the 8th century on Roman ruins and classic Roman design. It towered over the bay guarding the Dardinelles. After lunch we found the winery but alas, no tasting, only selling. Then we ferried back to Asia and drove to Canakkale, got another ferry to Europe and drove to Gelibolu (The Greek Gallipolis is better remembered as the site of a major battle in the 1st World War). 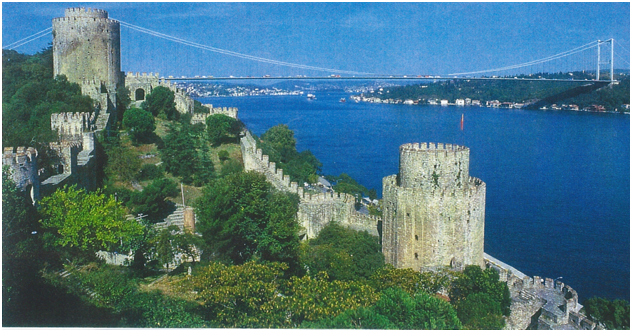 While crossing the Dardenelles, I noticed the many crumbling fortresses lining this most strategic body of water. More than 5 countries used the Straits to get to the Mediterranean, a vitally important access to commerce. From the looks of the many fortresses, it was not easy. We found Hotel Owa in the non-tourist town of Gelibolu and got a lovely large room. Our balcony overlooked the downtown and a very busy harbor. Our concierge recommended Ilham Restaurant for fresh seafood. We ate on the outside deck to watch the water action. Their special was grilled sea bass and it was excellent. Everything was lovely. . .except for the three kids screaming and running down the aisle. Their parents totally ignored the disruption of all the other diners while they continued chatting with their guest. There was muted applauses when they got up to leave-they pretended not to hear. After breakfast served by our friendly, English speaking host, we left for Istanbul. Stopping first in Sarky for a wine adventure, but again, no tasting, no tour, wine sales only. Very frustrating to my wine educated husband whose avocation is teaching wine appreciation. Since I do most of the driving and Mike navigates, I asked for a break in a tiny village where we could park in front of the cafe. The travel books recommended the importance of car and luggage observation. Mike preferred to review the map route and remain in the car. 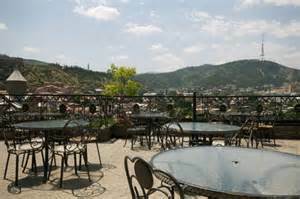 I climbed the porch steps and asked for a cup of “chai” (the Turkish all-day-brewed tea). An older man in a worn sports jacket walked up and asked if he could practice his English. I smiled and nodded. He said his home was Istanbul but he Summers in this village. Two more men joined in and then a fourth. They spoke no English. Getting nervous I called for Mike to join us and the three additional men immediately left. The first man continued chatting for a bit. We have found that most Turks were very friendly but the 3 guide books I read did warn that the men could be overly “friendly” to fair-haired, light-eyed foreign women. As we drive off I saw 2 women fully arrayed in black standing at the kitchen door, glaring at me. One was drying her hands and the other holding (brandishing?) a frying pan. The remainder of our drive to the airport paralleled the Mamara Sea, and it was beautiful. The international airport, like all others, was very confusing but we successfully returned our Sun car and they graciously drove us to our hotel, describing points of interest. They would pick us up at 10:00 tomorrow for a tour…no additional charge. 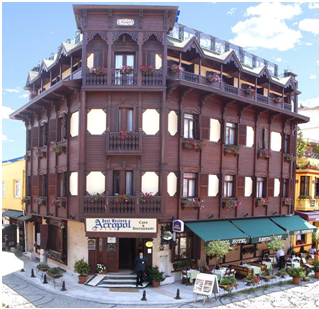 I had reserved The Hotel Acropol months before, and since they were not crowded, our concierge took me on tour of the available rooms. 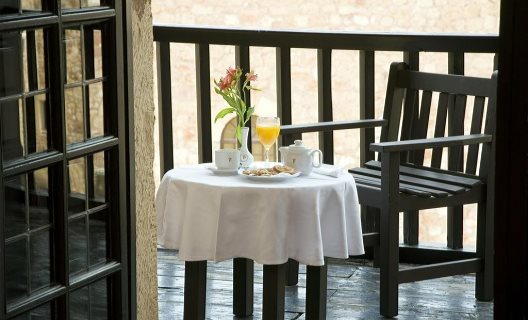 He offered a discount for #503 mini-suite; located on the top floor with a balcony that overlooked the city. 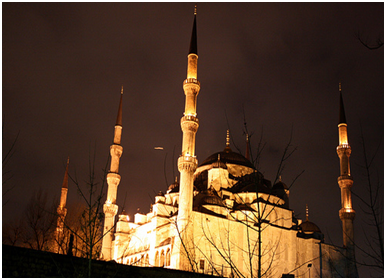 It had a clear view of Haya Sofya on our right and the beautiful Blue Mosque on the left. We looked over the main street of Old Town. We ate an excellent dinner at the nearby Suites Hotel on the outdoor patio and had an interesting conversation with a Swedish couple at the next table. Afterward we enjoyed a glass of wine in our hotel’s top floor restaurant, watching the container ships cursing through the Maramara Straits. This had been going on for centuries. What an amazing vista. Our tour guide Acif picked us up at 10 and we walked the cobbled stone streets to Haya Sofya. Mobs of people were waiting in line. Using his “tour guide pass”, Acif swept us through. Haya Sofa was enormous and overwhelming. The bright tile work, colors and the height and breathe of the ceiling vaults were incredible. The building corresponded to, but predated St. Peter’s in Rome, and was the headquarters for the Greek Orthodox Church for the Eastern end of the Greek Empire. Next we went to the Blue Mosque. The Sultan Ahmet donated this whole area to the neighborhood community in the 15th century: the Mosque, a school, the hospital and an alms house. There were masses of people waiting to enter but our guide flashed his pass and we moved to the head of the line. We bagged our shoes in plastic, doned slippers to walk into the carpeted building. Acif led us to a corner and showed us the typical Muslim prayer: face wipe, ears, hair and chest with prayer to give “comfort” to the prayers. Then he knelt on the carpet saying incantations while resting his head and arms on the floor. We were not the only ones who enjoyed watching him. Then we Visited the Turkish Museum of Art noted for its extensive array of carpets. The old prayer rugs were threadbare from the knee indentations over many years, but had worn beautifully. All women were required to weave a “marriage” carpet before the wedding which could take up to five years of work. This was considered a retirement necessity and when sold 40 to 50 years later could bring a good bit of money. The ones I saw were priced from 50,000 to 200,000 thousand dollars… and they were exquisite. Strangely enough none of the museum’s female manikins had faces. Just skin colored material stretched over the head…and totally blank. After awhile, I could not look at them. Then our guide escorted us to a carpet store. They served us Chai and presented a remarkable history of Turkish carpets. There were sample rugs that had been laid on sand and trampled by goats, sheep or cows before they were deemed worthy to sell. They were remarkable. There were samples of “marriage” carpets that could only be worked on when the weaver was in a “good” mood (Beats not tonight honey I have headache). Some of the carpets were woven with silk and were exquisite. I asked for prices but the salesman said “not yet”. At the end of the presentation he asked me to pick out a rug I really liked. I did. The price was $13,000. I said I have a headache. They were very disappointed. They dropped the price. My husband said we would have to talk about it and would let them know. Although Acif was disappointed we did not purchase anything, and I understand why, my husband gave him a very nice tip for the wonderful and informational tour. 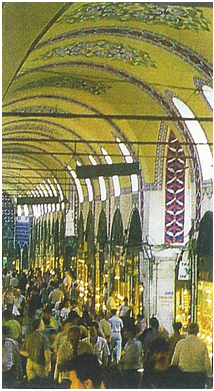 Later we walked to the Grand Bazaar. Old buildings connected by canopies covering alleyways and went on for miles. Shops, small stores and many individual stands selling anything and everything to the hordes of people wandering through. We ate dinner across from our hotel at Albura Kathisma Cafe. Excellent lamb dish. We took the remaining wine from our room to our hotel’s top floor restaurant and again sat overlooking the sea of Marmarna. Passing ships, setting sun burnishing the waves. Magnificent. After breakfast, on our last day in Istanbul, off to see the Topkapi Palace. Built next to Haya Sophia in 1560, it is an opulent campus with four courtyards separating the individual palaces. It seemed like there were thousands of people. Because of the crowds, we skipped the palace-museums and walked all -the way to the end. It was closing time so we walked to a cafe just outside the entrance for coffee. Watching the hoards rush to the busses, I wondered how many different nationalities we were seeing. Time to pack up and get ready for our 3:30 AM airport pickup tomorrow for the 6 AM departure for Amsterdam and the USA. After organizing our luggage, we walked down the street to Premier Suites again for dinner on the outside patio. Back at our hotel in our lovely suite, I stood on the balcony looking at the night lights on Aya Sophia and the Blue Mosque. The street noises were soft and the human voices musical. Good night Istanbul! These two Independent Travelers would only come back in our memories. This is one of several overviews because the area is so large! The most noticeable sight is the Hanging Houses on the right that lead up to the old town. Looking at the walk way below, there are a few hardy souls heading for the old town. In the ravine is the river that together with the Hanging Houses, helped keep out the attackers over hundreds of years. You can see a bit of the town in the distance. 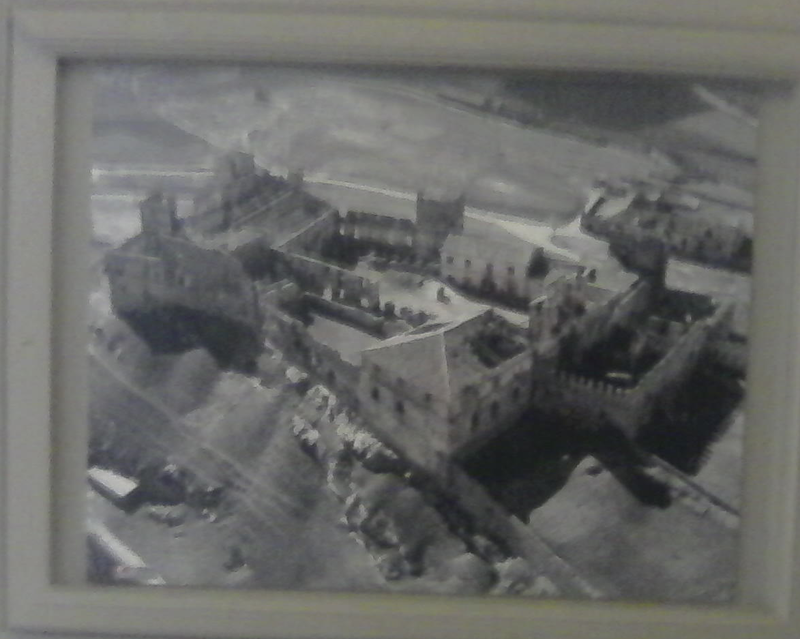 This view of our lovely Parador was originally the site of a 16th century convent and retained some original paintings. This area, Costilla-La Mancha, was immortalized by Cervantes (1547) in “Don Quixote de la Mancha”. The tall, skinny knight riding a sway backed horse and wearing a medal dish as a hat and accompanied by his side-kick, Sancho. Both were out to defend those who needed protection….and did! 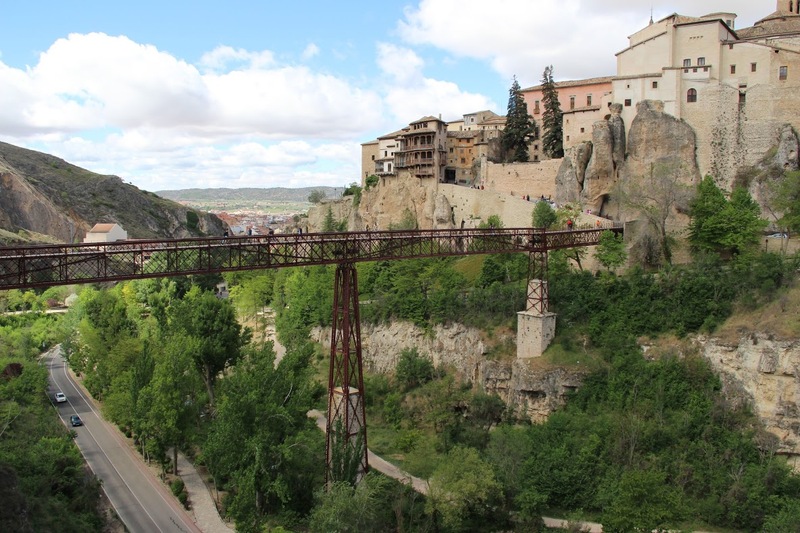 This infrequently visited area has great mountain ranges, dramatic gorges and the two cities of Toledo and Cuenca and these were the factures that drew us to Cuenca. Four of these hallways encircled a beautiful outdoor patio (I could not take a picture because of the bright light). The comfortable furniture, and nearness of the bar made social interaction available ….weather rain (rare) or heat (hot summers)….air conditioning within. 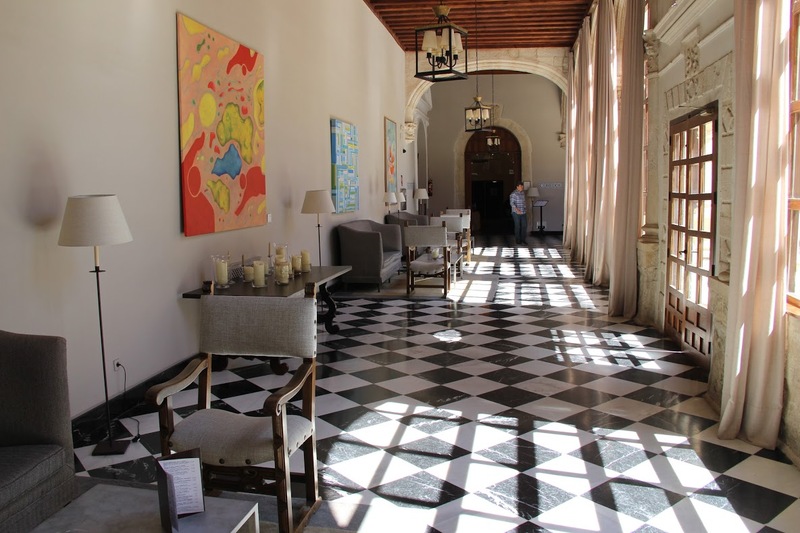 This view of our lovely Parador was originally the site of a 16th century convent and retained some original paintings. This lovely painting above a large doorway was one. We separated after breakfast: Bert, a photographer, and his wife, Frie, were off to explore. Shortly thereafter Mike and I followed, but a little more slowly. After crossing the track and walking steeply uphill, this was a fantastic close-up of a Hanging House. It was open for tours. But the first room WAS the balcony… and there was no way I was going to look out or down from there! I took this lop-sided picture of this 12th-18th century Cathedral because of the horde of people surging up the steps trying to enter the church. Little did we know that it was the beginning of May Day Celebration in the square and the church was locked. There was laughter, music, and finally prayer. This assuages my desire to see the antiquities housed inside. The younger priest wending their way through the crowd to line up before the stage. This joyful celebration was worth missing the 12th and 18th century antiquities in the Cathedral. My opinion is that this row of religious were older, because they got the seats. Because of the crowd (and not understanding much of what they were saying) we moved on to eat lunch and of course have a glass of lovely wine. These ceramic tiles shown on the back of the dinning room wall were done during the 14th century. Interestingly enough they were made by musicians of the time and they placed their work upon this wall. The parador saved it. —-Many of the pictures are by Burt Haegemans. Although I saw no, “Don Quixote” these Spanish people are wonderful! 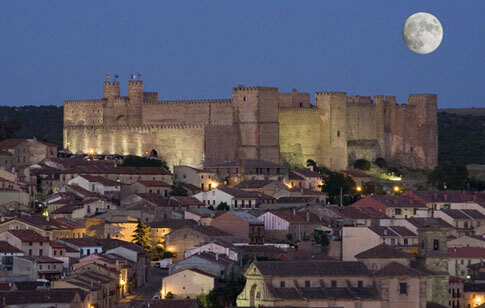 This 12th century medieval castle was begun in 1133 and built on a Roman settlement. Until this last century it was the enclave of bishops and cardinals who maintained this castle and the Cathedral in the adjacent village. Although an exceptional entrance portal, there were a few drawbacks. There are 40 wide steps up to the massive doors…and difficult to drag the luggage behind. Happily there are 2 elevators to get to your floor…and ours was on the 4th! A small altercation when the receptionist said “no balcony” caused me to snag my Reservations out and show her “Superior, with balcony”. Then smiles. It had a lovely view. The timing was good. We were surrounded by greenery and they were just putting up the umbrellas . From what we could see on the location map, there were only two main streets that converged in the Central Plaza. These were commercial, narrow and stoned. With no car…need better shoes. The downtown Plaza much improved as we approached the Cathedral! The church is just behind the plaza. We went to enter and found the church was locked (probably closed for lunch). We walked around this beautiful 12th century structure that the religious owners of the palace- for almost a thousand years- had also enhanced the cathedral. After this we limped our way back to the parador and passed this picture in the lobby. This picture was the only info I could find of the original building after its destruction. During the Spanish Civil war in the 30’s the bombing wrecked havoc on the castled. Looking closely you will see there are a few structures remaining. This original chapel survived! 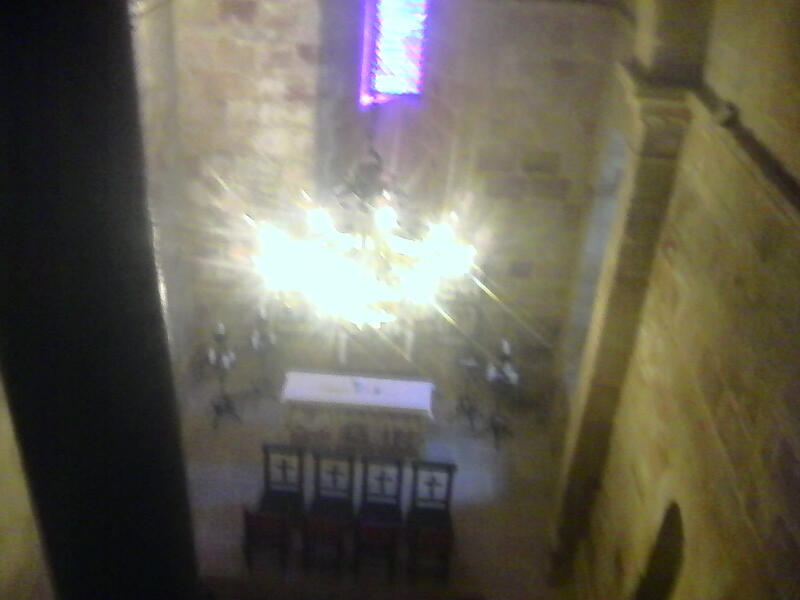 One of the service people had to lead us to the balcony so we could see. Because of its age they don’t allow tourist to enter the lower levels, nor are there any signs for it. Lovely original and mostly formal dinning room. Mike ordered a scrumptious bottle of wine to go with his seafood and I had to accept it graciously even though I was having “kid” (baby goat). And that night we slept like babies. The following was an evening shot from the city below the parador. And what a memory! 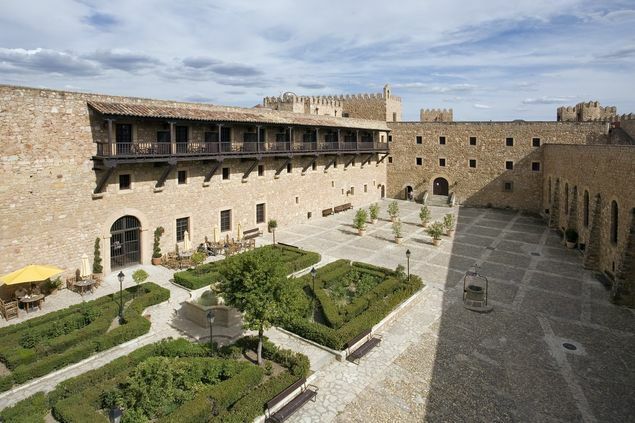 Not the biggest parador…but certainly being established in the 11th century makes it one of the oldest. 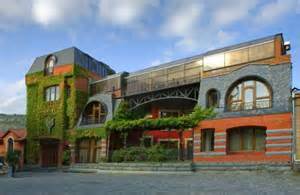 Driving in, left side, bottom, and curving up to the parking lot behind, you walk through an iron portcullis to the inside of the courtyard. The village it still guards is behind the tower. Notice the high ramparts ….you will see us walking around them shortly! This Medieval Arab Fortress was an exceptional witness to the Reconquest beginning in the 8th century and it perfectly preserves and maintains the aura of Arabic influence. Our bedroom, high on my priority list. I enjoyed having some of the “original” castle (left wall of rocks) to lull us to sleep. The window just above the staircase was our room. 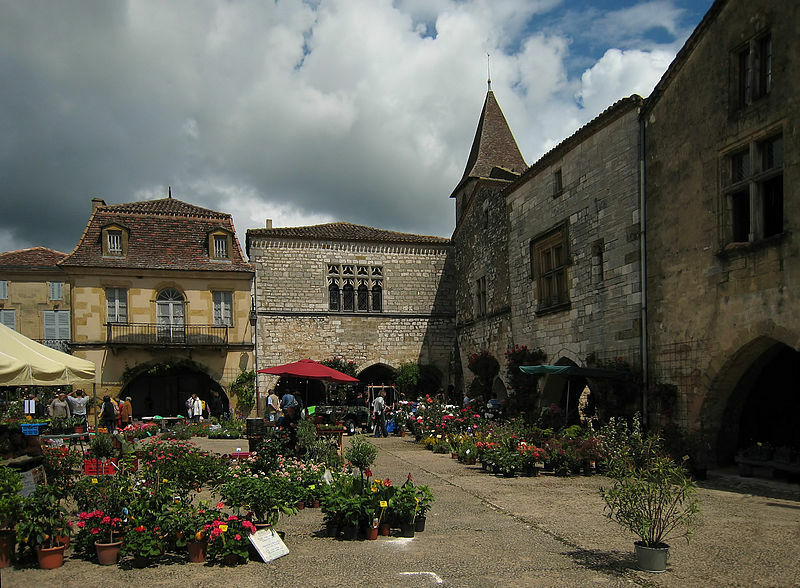 It looked down On the small but lovely courtyard with tables, umbrellas, greenery….and a couple drinking wine! They were very friendly and asked us to join them. We did. 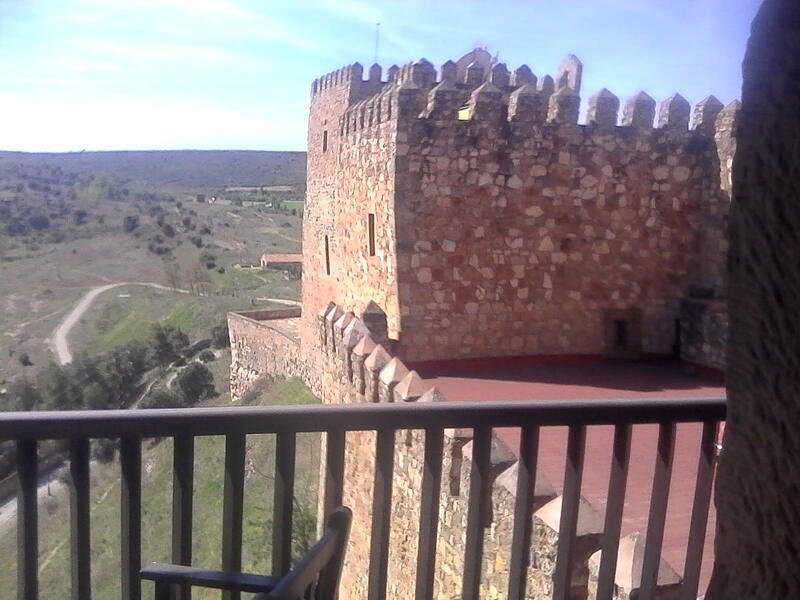 I told them what I had over heard from the concierge earlier talking to a customer: “Yes, you can go up to the battlements, walk carefully around the perimeter and please return the key.” And while we were there with Bert and Frie the couple with the key returned. Naturally, we ran and got the key for ourselves. This is what we saw when we got to the top of the turrets. Leaning down we saw the River Jucar below circling the ramparts. I could see Mike puzzling over what lie beneath us- or whether or not he was going to jump- but he looked puzzled by what he saw. We found out later that it was set up for paddle boats, canoes, etc for taking short trips around the river. Bert and Frie added that we hand’t finished the wine yet and it was getting warm. Whoops, we were going down the stairs very quickly! ——The previous 4 photos were courtesy of Bert Haegemans. Before meeting our friends for dinner Mike and I wanted to see the very old village the castle had guarded, and a very special church. Walking through the village on the rough heuwn steps, you can see the church (dark brown at the very top) but it was locked. A native offered that it was rarely opened except for special events because of its antiquity. The dinning room that evening was beautiful with excellent roast lamb! A bit crowded but this Parador can only accommodate 28 people. 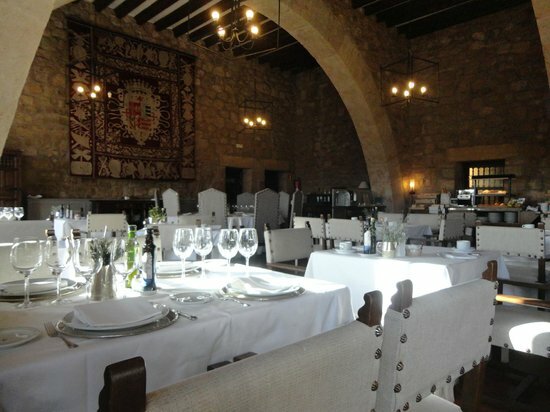 We found out that our new friends were also moving on to the next Parador that we had reserved for 2 days- how wonderful! 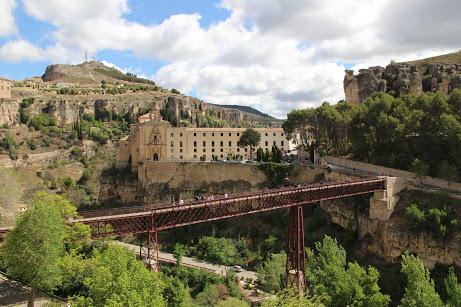 To be continued– with the Parador de Cuenca. We’re on our way down from New Helvetia Hotel and the marvelous hills and mountains surrounding. Rough and stoney but drivable roads, with no traffic. The Zambartas winery was both beautiful and their “tasting room” delicious. Please notice the background of the enormous vineyards rolling off down the hills but not- climbing the mountains behind them. This rough country is protected by the gifts of nature; rocks for everything: houses, roads, walls, and most importantly things drinkable. A little background of Cyprus in necessary. In 1119 Richard the Lionheart conquered Cyprus. The reason for this (and other bloody battles) is apparent. Cyprus lay at the crossroad of the Eastern Mediterranean and its rich copper deposits were the cause for the first steps out the Stone Age. (And the reason for its name: Kyprus = Copper). The Troodos mountains (which we had just left) contained large deposits of copper and Cyprus became the largest producer and exporter of copper in the Mediterranean basin. “Cyprus is a small island–roughly 3500 sq. miles, making it larger than Delaware but smaller than Connecticut,–in the eastern Mediterranean Sea. It lies 60 miles west of the Syrian coast and miles south of Turkey’s southern shores. Athens is over 500 miles to the northwest. Our last stop was this Castle Kolossi. 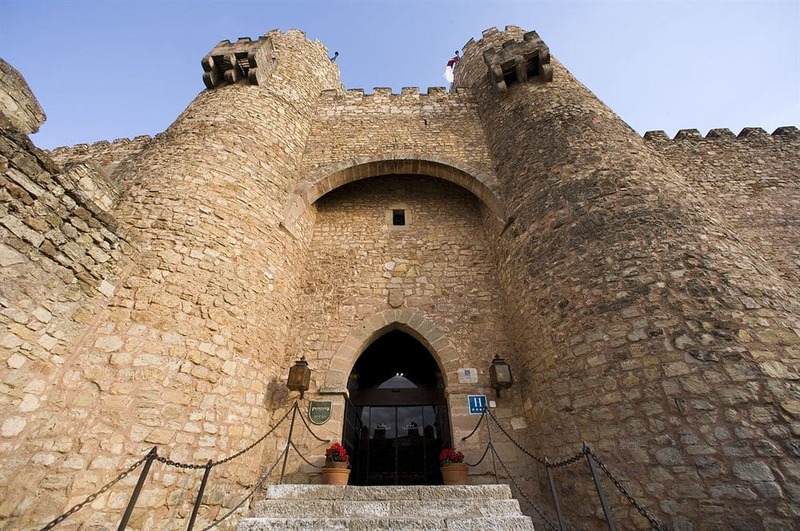 During the 13th century, the castle served as the Grand Commander of the Knights Templar and after the fall of Acre in 1291 the castle served as the headquarters of the knights of the Order of St. John of Jerusalem. It was built with military architecture offering security within the area and resisting any attacks. At a height of 21 meters and a length of 15 meters on the outside and 14 meters on the inside. Now enough education, back to the Zambarta’s winery for some drinks— and it was good! “The Sweetness of your love is like Cyprus wine.” Mark Antony said to Cleopatra as a wedding present.